GOKPOP | Exclusive K-News in Malaysia & Singapore: Chingu MUMA Festival Final Surprise: A Mystery K-pop concert in Seoul! 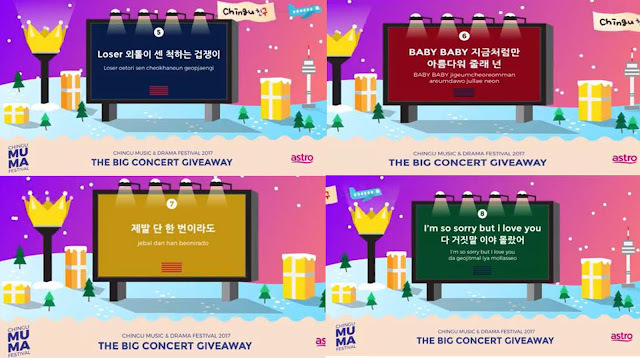 Chingu MUMA Festival Final Surprise: A Mystery K-pop concert in Seoul! Chingu Music & Drama (MUMA) Festival has spread the best K-entertainment in 2017 by sending the chingus to 2017 MAMA, 2017 KBS Drama Awards and 2017 KBS Song Festival. 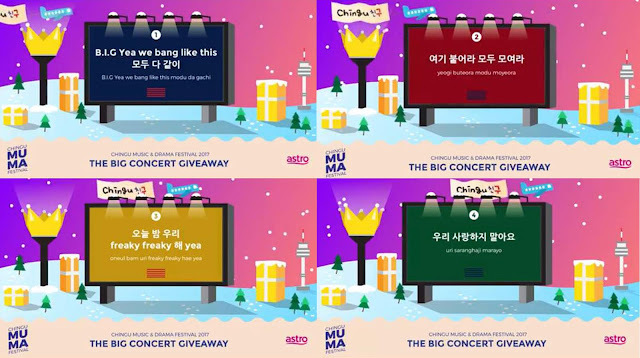 To mark the end of this celebration, Chingu holds the final contest which will be sending 1 winner to a mystery K-pop concert held at the end of December in Seoul. Step 2: Tell us who is your best chingu and dedicate an appreciation message to this friend. You can write either in English, Malay or Chinese. The participant who identified the 10 songs correctly in order and created the most original/creative message within 50-word limit will win the grand prize! Don't miss out this big present from Chingu.